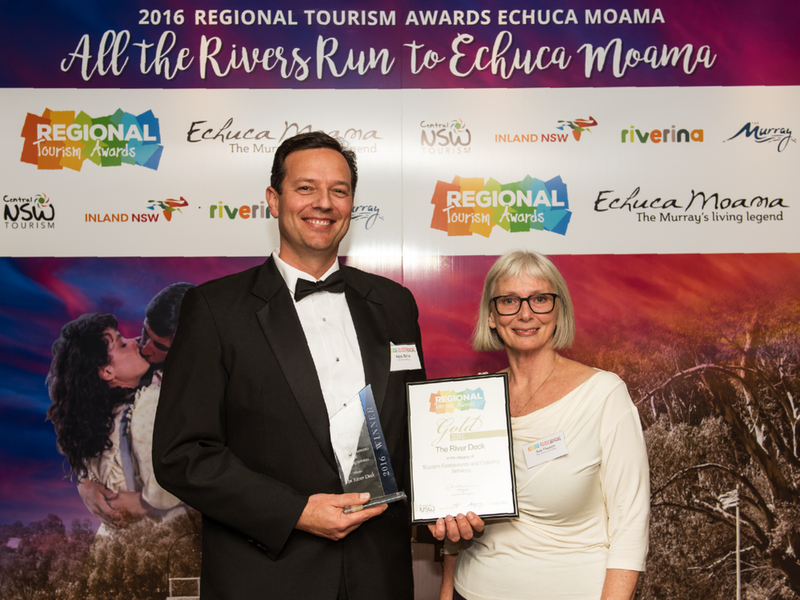 Alex (left) accepts Gold in the Tourism Restaurants and Catering Services category for The River Deck at the 2016 Regional Tourism Awards in Echuca Moama. The River Deck entered the regional and state awards in 2016 and 2018. We were fortunate to be awarded Gold twice in the Regional Tourism Awards and Silver in the State awards in 2018. To be honest, in 2016 we entered for some recognition and to benchmark ourselves against other entrants. We approached the 2018 the entry process differently, which identified areas for further development and became a useful strategic tool for The River Deck. We will be entering in 2019 so we can share our progress over the past year. It’s a good opportunity to take some time to reflect on what’s been happening and achieved. There are plenty of people out there who are willing to help you through the process to enter. Yes, there is work involved, so make sure you budget some time and approach it in smaller segments rather than tackling the whole application as a whole! If Alex’s advice has got you thinking more about entering, the best place to start is our How to Enter page. If you’ve got questions, head over to our FAQs or get in touch.